It is official now: IPADS and ZEF on the move! The cooperation on paper becomes real. With the recent signing of two Memoranda of Understanding between the University of Tokyo and the University of Bonn on the one hand and the MoU between ZEF and IPADS on the other, the “strategic international partnership” between the institutions in Japan and Germany has become official. 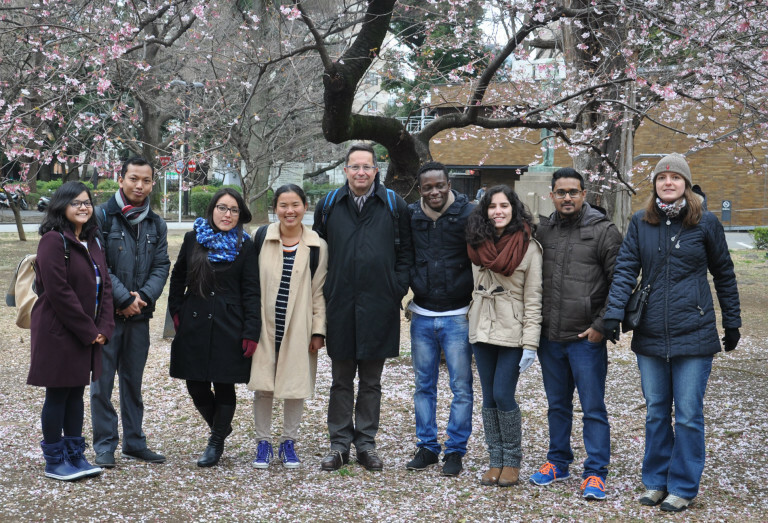 This has also practical implications, as the first group of ZEF doctoral students has traveled to Tokyo for a research and educational exchange with around 20 currently enrolled IPADS (doctoral) students from March 11-21, 2016. The partner institute IPADS stands for “International Program in Agricultural Development Studies” and it is part of the Graduate School for Agriculture and Life Sciences of the University of Tokyo, which is also affiliated with the Faculty of Agriculture. The six doctoral students from ZEF, coming from six different countries and five (sub-) continents, are eager to learn something about crop modelling and agriculture but also about life and studies in Japan. “This is going to be hard work but also a unique experience” says Florent Noulekoun from Benin. “The courses and practical work we are going to do here on the experimental site of the Faculty of Agriculture complement my work on afforestation in West Africa”. 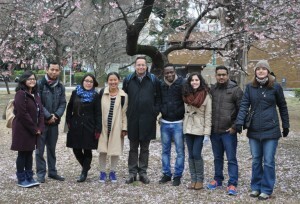 Professor Okada has been teaching students in Bonn recently, while IPADS students in Tokyo were connected via video and could thus join the classes. Last year, ZEF senior researcher Manfred Denich traveled to Tokyo to teach students at IPADS. Besides working hard, of course the students hope to get at least an impression about life in Tokyo in such a short period. Going shopping or out for a meal without any knowledge of the Japanese language is a challenge and requires curiosity and courage. But these are characteristics all scientists should bring along in their personal luggage anyway! The University of Tokyo is one of the most renown national (non-private) universities in Asia. It is one out of six universities in Tokyo, it has 10 faculties (University of Bonn has seven), around 28,000 students (University of Bonn: 32,500) of whom around 2,100 international ones (University of Bonn: 4,000). There are around 2,400 Professors (including Associate Professors) whereas Bonn’s University has only 544. In the picture on top: the six ZEF doctoral students visiting IPADS with Dr. Günther Manske, Academic Program Coordinator, and two IPADS students from India and Vietnam. ZEF’s students in the picture are: Sophanrith Ro (from Cambodia), Melissa Quispe Zeniga (from Peru), Florent Noulekoun (from Benin), Layla Hashweh (from Palestine), Eeusha Nafi (from Bangladesh) and Janina Kleeman (from Germany).